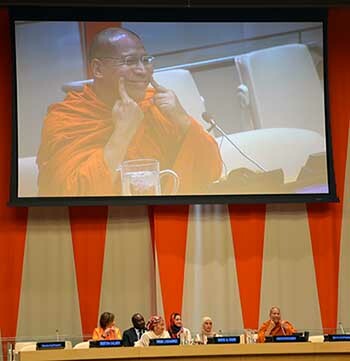 Left: Phra Shakyavongsvisuddhi, of Mahamakut University in Thailand, discusses happiness at the United Nations. 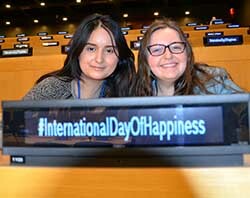 Above, Notre Dame of Maryland University students Kelly Tandan and Meghan Wood at the happiness panel. As The World Happiness Report 2017 was released at the United Nations on Monday, a special panel convened to discuss the concept of ranking countries on a happiness scale and the importance of the Sustainable Development Goals (SDGs) in achieving happiness. The 17 SDGs are intricately linked to happiness, said Amina J. Mohammed, Deputy Secretary General of the United Nations. “Our societies cannot be happy when the vulnerable and marginalized continue to suffer,” Mohammed said. “Happiness is not wealth, just as GDP (Gross Domestic Product) is not wellbeing. I have seen happy people who are poor. We must look to our governments to achieve SDG One and all the goals. Jeffrey Sachs, co-editor of The World Happiness Report 2017, said governments have an obligation to improve the wellbeing of their citizens. The top countries have common frameworks, including universal access to health care, education and safe environments for all. The SDGs, he said, are important elements. The World Happiness Report ranks 155 countries by their happiness levels. The top four countries, in order, are Norway, Denmark, Iceland and Switzerland. The United States ranked No. 19. Responding to Sister Eileen Reilly’s challenge to the Notre Dame of Maryland University students who are part of the School Sisters of Notre Dame delegation at the United Nations this week, Kelly Tandan stayed after to meet Ohood Al Roumi, the minister of happiness for the United Arab Emirates. Her office integrates happiness into government policies. She explained that her mandate is to take happiness into practical daily practices in government and society.